After an opening scene showing an intense battle, you’re put at ease by the charismatic charm of Taron Egerton, who many may recognise as the loveable goofball turned secret agent Eggsy from Kingsman: Secret Service and Kingsman: The Golden Circle. The Robin Hood narrative that we remember from our childhood this time is portrayed as a darker and more sinister tale. It’s the legend you know and the story you don’t (yet). 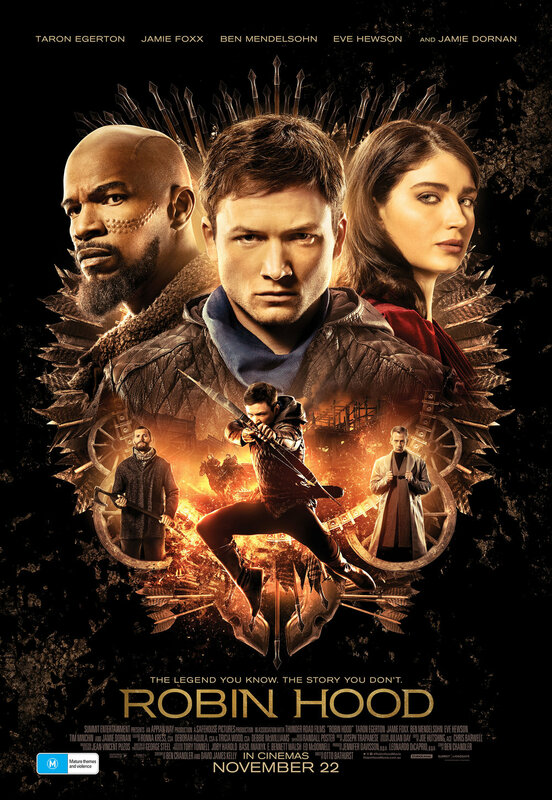 We learn that Robin has become a war-hardened crusader, and alongside his Moorish commander, Little John, played by Jamie Foxx, the pair mount an audacious revolt against the corrupt English Crown, led by the Sheriff of Nottingham, superbly performed by Aussie-born Ben Mendelsohn (Bloodlines and Rogue One: A Star Wars Story). Ben’s depiction of the dictator is on point with his ability to summon a feeling of hatred from the audience towards his character as he places a bounty on Robin and destroys the city. Even without his signature black eyeliner, you’ll recognise Australian comedian and actor Tim Minchin, who plays Friar Tuck, by his comedic quips and relaxed tone as he breaks up the slightly macabre scenes by adding comedic value. Rounding out the ensemble is Jamie Dornan, who plays Will Scarlet, who, even with his charming Irish accent, struggles to keep Marion by his side compared to his romance in the Fifty Shades of Grey films. Robin’s the same courageous, strong-willed and passionate Robin of Loxley we’ve come to love — cheekiness included. He’s filled with a desire to right the wrongs, and with Little John by his side he becomes the warrior we know as Robin Hood. Together they form a brotherly bond as they scheme, tirelessly train, and hide their intentions from his past lover, Marion (Eve Hewson), who has moved on with Will Scarlet thanks to the Sheriff’s conspiring ways. As the pair set out to inspire the commoners to revolt, we see the transition from the Lord of Loxley to the iconic Robin Hood. Action is around every corner as we watch Robin steal money from the rich and eventually steal the girl too, sandwiched between action scenes, vicious fights, explosions, and even a horse chase up a flight of stairs. The ending leaves an opening for a second instalment, which means we’ll be first in line to catch this skilled archer reignite his chemistry with Marion.